Now That They've Been On The Today Show, Will My Tweets Unionize? 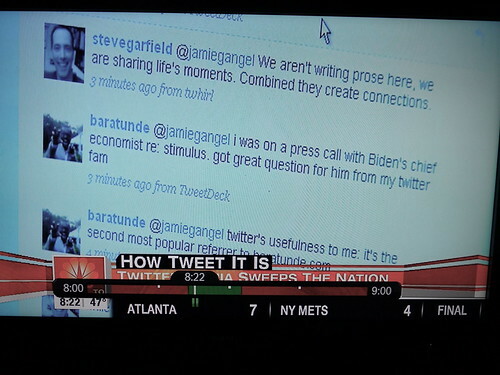 Steve Garfield (http://stevegarfield.com) captured this screenshot the old-fashioned way: he took it without the express written permission of NBC and redistributed it. A few weeks ago, I noticed him talking with Today Show reporter Jamie Gangel on Twitter. She was asking all sorts of questions like, "Why do you use Twitter?" Never one to shy from an interview, especially one not involving me, I started pelting Gangel with answers as if she were interviewing me. Eventually, she could not ignore my projectile tweeting, and she followed up with a few questions to me directly. Here's the thread (http://bit.ly/Lmj8). You can click on "show conversation" under the first result to sort of see how it went down. It makes less sense without seeing the questions Gangel was asking Newt Gingrich etc. The worst part? My tweets are probably gonna get representation before me.